Cloth Diapers vs. Disposable: Which Is Better? Whether you choose cloth or disposable, diapers are part of the parenting experience. Newborn babies can go through 10 or more diapers every day, and the average child won’t begin potty training until about 21 months old. In fact, the U.S. Environmental Protection Agency (EPA) estimates that the average baby will use 8,000 diapers before potty training. Fortunately, there’s no right or wrong decision when it comes to diapers. You can choose one or the other or a combination of both if that suits your baby, lifestyle, and budget. 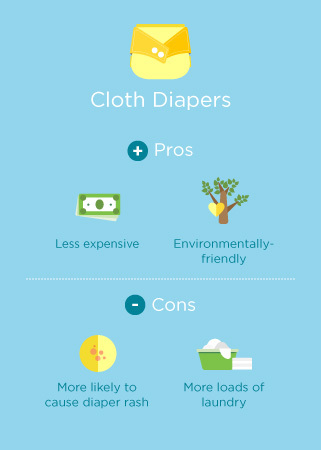 Here’s what to know about cloth and disposable diapers to make the right choice for you and your baby. Today’s reusable cloth diapers come in a number of styles. Most options feature a waterproof cover or outer layer and an absorbent insert or inner layer. Some inserts are snapped into the cover, while others fit into a pocket. There are also all-in-one diapers that combine the cover and insert in one system. There are a few different materials for the inner and outer layers of a cloth diaper. This material is derived from plants or animal materials. While they may be more expensive, they wash well. This is a man-made option. They can be less expensive than natural fibers, but may hold on to odors. The material from which it’s constructed impacts a cloth diaper’s absorbency. Cover options are typically constructed of the following. Polyurethane laminate (PUL)/thermoplastic polyurethane (TPU): These covers are made from lamented polyester. They’re widely used and affordable. They’re waterproof, but not particularly breathable. Microfiber: These diaper covers are made of soft polyester. Cotton: These PUL/TPU options are covered with cotton for softness and come in a variety of prints. This option is more prone to leaks. Fleece: Another polyester option, fleece covers allow for more air circulation. Wool: A naturally antimicrobial choice, wool covers are breathable and quite absorbent. Nylon: This option typically offers a good mix of breathability and absorbency. Some inserts are disposable, which can be a good option for parents who want to use cloth diapers as inexpensively as possible. Absorbencies will vary depending on the material. To care for cloth diapers, follow the individual manufacturer’s instructions. In general, solid waste is dumped in the toilet and the insert and cover are rinsed in cold water, then soaked in a mild detergent and bleach solution before being washed. Be sure to wash cloth diapers separately from the rest of your laundry. Disposable diapers are available from many manufacturers, but the design doesn’t vary. It’s a single construction made of a soft liner that wicks wetness, an absorbent core, and a waterproofing outer layer. Today’s disposables are very thin and light. After use, they simply go in the trash. There’s an environmental toll — all disposables go to the landfill. The production of disposable diapers can be environmentally costly as well. Nearly 70 percent of a disposable diaper is made of paper, and that comes from trees. The other 30 percent is often derived from petroleum, which is a nonrenewable resource. Eco-friendly brands of disposable diapers are free of ingredients like perfumes, latex, and chlorines. Some of them have a percentage of compostable materials as well. These diapers are more expensive than traditional diapers, but tend to be more responsibly manufactured. Cloth diapers are a one-time purchase. According to Consumer Reports, you’ll save hundreds of dollars over disposable diapers. Disposables can cost between $1,500 and $2,000 or more in the few years your child wears them, and it’s even higher for eco-friendly brands. If you choose to use a cloth diaper service that washes and returns the soiled diapers, you’ll also save on the cost of water, power, and detergents for your laundry machine. But diaper services can be costly because you pay more for the convenience factor. 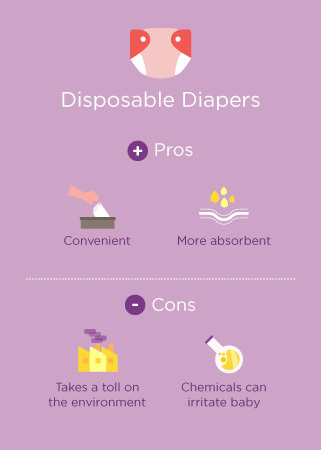 With cloth diapers, you aren’t adding to the landfill. That’s where disposable diapers end up, and they don’t all biodegrade quickly. According to the EPA, disposable diapers will be in landfills for centuries. Cloth diapers, meanwhile, require a lot of electricity and water to keep them clean. Modern cloth diapers are quick and easy to use, just like disposables. However, they aren’t as readily available for purchase, and you’ll need to say organized to keep clean diapers on hand. If you’re out and your baby soils a diaper, you can’t just throw it away like a disposable. There have been reports of children reacting to ingredients in traditional disposable diapers. However, there are many brands that are free of chlorine, latex, perfumes, and dyes. With cloth diapers, you can be certain of what materials you’re using. But because cloth diapers are less absorbent than disposables, children can be more prone to diaper rash. No matter which diaper you use, don’t leave your baby in a soiled or wet diaper for too long. Choosing the right diaper is a personal decision. It’s important to consider the pros and cons of each to decide what will work best for you.